This past weekend's allegedly racially charged pool party incident in McKinney, Texas, was disturbing, but nobody was killed — unlike other allegedly racially charged incidents over the past 18 months, which have left scores of black citizens dead. And while the focus has largely focused on the shooting deaths of black males in comparison to their white counterparts, far less attention has been paid to black female citizens who have suffered similar deaths at the hands of uniformed officers. Even without concrete statistics by the U.S. Justice Department, which often suffers from poor reporting on the local level, it's clear that while white women are shot by police more often, black women are often fired on under vastly different, often questionable circumstances. Given that data regarding black female deaths as a result of police intervention is almost nonexistent, explained CNN Legal Analyst Sunny Hostin in a December interview, the results are often skewed far below what their actual numbers truly are. "There isn't mandatory reporting, it's ... self-reporting," Hostin explained to The Situation Room host Wolf Blitzer. "Almost on the honor system." Hostin added that because of the lack of mandatory reporting, the number of deaths of black citizens by police was likely considerably higher. What we do know is this: Since the beginning of 2015, the number of officially reported white, female police shooting fatalities outnumbered black women by only a small handful, according to a composite sketch put together by The Guardian. Using crowd-sourced reporting and confirmed by police reports, The Counted is a project that was developed to investigate the real numbers behind police-related deaths in the United States. So far this year, reports the paper, 12 white women have been shot and killed by local police, compared to approximately eight black women, six of whom were killed by uniformed gunfire. The other two black women killed by police include one who was Tasered to death and another who was struck by a police vehicle. But the devil is in the details, and The Guardian's list of female police-related deaths is perhaps more telling than the tragic cover stories allow. Among the 12 white women shot by police this year, nearly all of them were allegedly involved in dangerous crimes such as murder or attempted assault on a police officer with a dangerous weapon (knives seemed to have been a commonality among the majority). Among the six black women shot by police, however, many were either considered mentally unfit or were killed under dubious circumstances. In February, for example, 38-year-old Yuvette Henderson, a black woman, was shot by police after officers claimed she shoplifted from a Home Depot while flashing a gun. The Emeryville officers claimed that she attempted to hijack three cars, then turned and pointed the weapon at police, who fired on her seven times, killing her instantly. It seemed like an open-shut case, but a closer look at the file revealed a bevy of mismatched witness statements and allegedly faulty police procedure. For example, conflicting witness statements indicated that Henderson was not, in fact, attempting to hijack vehicles, but was actually trying to flag down a bus. And while police claimed to have found a gun belonging to Henderson later, there was no evidence that she had committed the crime of which she had been accused, given that the store refused to release security footage from the day. And according to accounts by The San Jose Mercury Sun and the Daily Kos, none of the officers involved had turned on their department issued body-cameras, which meant that there was no video footage to back up their claims, which were contested by multiple witnesses. "Body cameras are a matter of muscle memory," claimed Emeryville police Chief Ken James in statement following the incident. "And in a critical incident when adrenaline is flowing, especially when we haven't done any of the training, it's understandable why he forgot to turn it on." Henderson's story isn't the only curious incident in recent months either. In 2014, a number of black women were killed by police under specious circumstances, including 47-year-old Yvette Smith, who was shot by Bastrop County Texas Sheriff's Deputy Daniel Willis during a domestic disturbance call. Police reports showed that officers had been called to the household when a fight broke out between several men. Witnesses said that Willis called Smith out of the house and shot her twice as she walked outside. Willis' lawyer declined to comment to the Austin American Statesman "out of respect for the Smith family." Although a grand jury indicted Willis on murder charges in June 2014 and Willis settled for $1 million this year, the damage was already done. "A part of me is gone, you know, and I wish I could have that back, but I can't," said Smith's twin sister Yvonne Williams in a statement to local ABC affiliate KVUE. "I just want justice for her." A national movement to bring these women's deaths to light, #SayHerName, grew out of frustration over the alleged willful ignorance on the part of the media, with activists participating in demonstrations to highlight the names and information of black female victims. And while outcry against Friday's pool party incident stemmed largely from claims of aggressive policing of young black teens rather than police shootings, the dots were already connected the moment McKinney Officer Eric Casebolt laid his hands on 15-year-old Dajerria Becton. In the media, we don't often hear about violence against Black women. But part of the reason we're talking about police brutality nationally is because of the tireless work of Black women. Their own pain ignored, they stand at the forefront, center and behind the Black Lives Matter Movement; hell, they created it. And organized the marches. In my activism work for marches, for bail runs, for protests, the vast majority of those brave people organizing and coordinating are almost always women. And they are overwhelming Black. And they are victims of police brutality too. And those victims are unnamed to the American public. 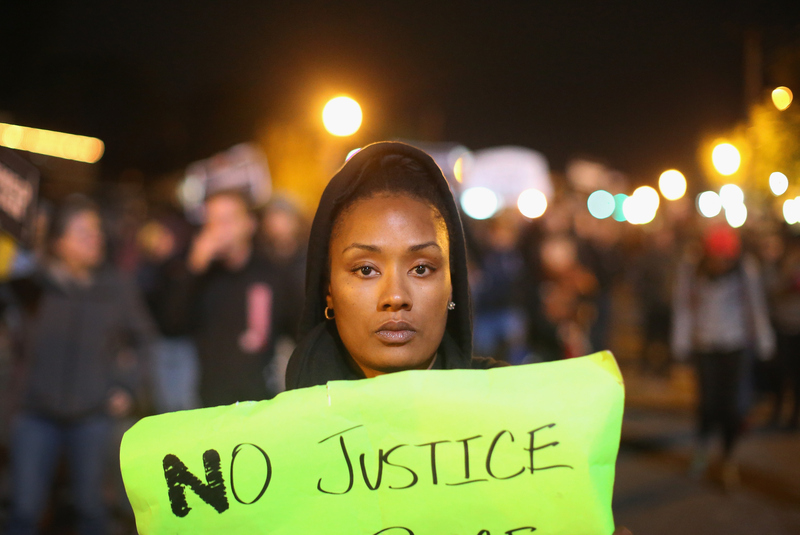 While the unofficial tally of black women shot by police may be statistically a little lower than that of their white counterparts, their stories are fundamental to the movement of police reform and justice review — you just have to dig a little deeper.